So here we are again, #campcocktail time! The last one was held in June 2013 and some of you have been asking for more. 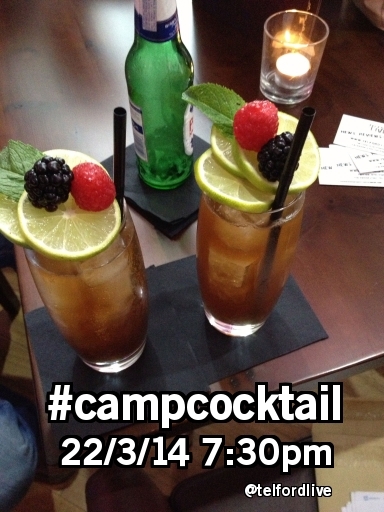 I can announce that the first 2014 #campcocktail is to be held on Saturday 22nd March at Carriages in Wellington, 7:30pm. What happens at #campcocktail ? We drink cocktails, mainly. We might then go to another pub, or not. As you can tell the organisation is kept to a minimum! You’re invited! Over 18s only because this is a drinking event. If you have come to sell anything, you’re coming to the wrong thing. Most of the people will be from Twitter or Facebook. About 30 turned up last time, possibly more this time, or I might be there on my own. Either way, I’m going to have a great time. I’m coming on my own will anyone talk to me? I’ll talk to you! I’ll also introduce you to some of the others there. What I will also do is arrange some sort of low-key activity, like a quiz (it will be a quiz) that you can work with others to answer the questions. No prizes. I wore a Tux last time, and ended up in ‘spoons. Not again. The only rule is; no hats. Who is the drunk guy? No idea. He had a great time though! UPDATE: Well, what a night! Some of the pictures are unsuitable to put up here, and the rule is, what happens on #campcocktail stays on #campcocktail ! Preparing the final list for the Naughty Table…. Hoping to be there.. Last minute stuff kept me away last year… Sounds fun& I love a cocktail…… Or two!